Dutch Low Saxon (Dutch: Nederlands Nedersaksisch; Dutch Low Saxon: Nederlaands Leegsaksies) is the Low Saxon dialects that are spoken in the northeastern Netherlands. The rest of the Netherlands speaks Dutch, Frisian or Low Franconian languages. They do not form a coherent language family. In 1975, the rock 'n' roll band Normaal boldly shook all perceptions of Low Saxon and its speakers. Until then, Low Saxon was mostly restricted to traditional folklore music. Normaal openly denounced all Dutch disdain, praised farmers and local farm life and boldly used Achterhooks Low Saxon, voicing the opinion and feelings of many Dutchmen of non-Dutch-speaking origin. Their hit song "Oerend Hard", a song about two bikers who lose their lives in an accident, took the charts by storm, and it is niw regarded a true evergreen of Dutch music. It quickly garnered them a large fan base, even in non-Low Saxon areas, such as Fryslân and Limburg. They inspired many other young rock 'n' roll artists to sing in Low Saxon, who now form a subgenre of their own in the Dutch music industry, which is gradually becoming aware of the genres commercial potential. The plural is -en rather than -(e)t, as is found in West-Veluws and Urkers and clearly from Dutch influence since a unified plural in -(e)t for verbs is common in Low Saxon. The dialects have wiej warken instead of wiej warkt for "we work". The feature is, surprisingly, also found in Stellingwarfs and Grunnegs. The trait is believed to have Frisian rather than Hollandic origins, however. 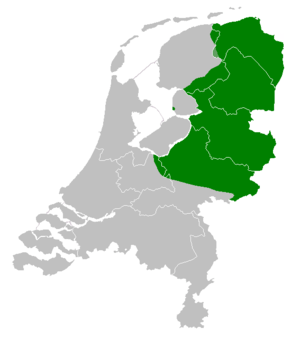 The Stellingwerven have been Frisian for centuries, and Groningen spoke Frisian in the Middle Ages. Modern Frisian has -e there. -en might be a kind of intermediate form between -t and -e. The unified plural takes the form -et rather than -t in the Achterhooks dialect of Winterswijk and in the more conservative southern Tweants varieties, which border the Achterhook. ↑ Michiel Veenstra presenteert een uur lang in het twents. ↑ Denge, G.J.M. ter. Linguae Intergermanica: The Use of Low Saxon, English, Dutch, German, and Receptive Multilingualism in Northern Dutch – Northern German Communication. 2012.